I am sure this beautifully made and captured dish will win your heart. 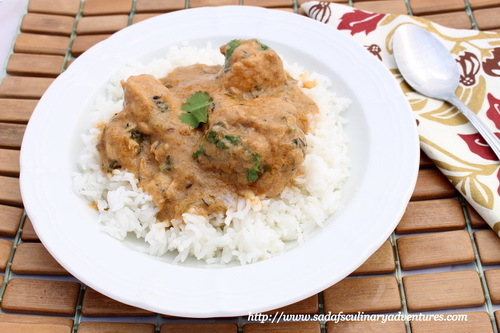 I am thankful to Sadaf Afshan, who has shared her tempting recipe with us. When I started learning food photography and researched about food photography, I found Sadaf’s blog, “Sadaf’s Culinary Adventures“. After Lubna Karim’s blog i am highly inspired by her recipes and photography.In her every photograph there is something different and unique. Besides her recipes and photography, her reviews are awesome too. “I would like to start off by thanking Ainy for giving me the opportunity to write a guest post for her lovely blog. 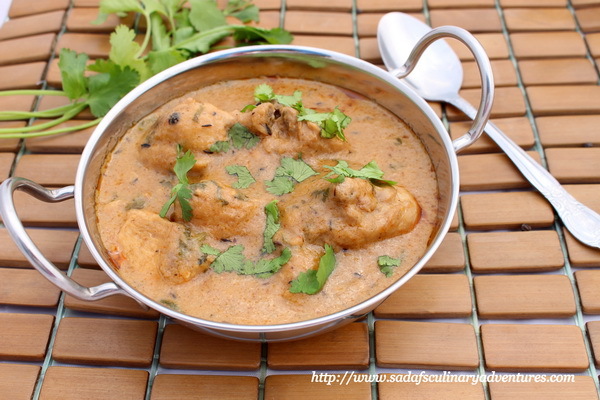 I really feel honored to be given this opportunity.I am sharing a Low-fat, Creamy Chicken Curry recipe which has become my go-to recipe for Chicken Curry lately. Low- fat and creamy might sound like an oxymoron but the fact is that it’s indeed possible to attain a rich tasting, smooth gravy without using ingredients like cream, butter, nuts or coconut. This recipe uses low-fat yogurt and caramelized onions for the gravy. I prefer to use a heart-healthy oil such as canola which has a neutral flavor. 1) Rinse chicken and pat dry. 2) Heat 2 tbsp oil and sauté the sliced onions on medium-high heat for 4 to 5 minutes until beginning to color. Reduce heat to medium and sauté until dark brown, 12 to 15 minutes longer. 3) Remove the onions from the oil and spread them on a plate lined with absorbent paper towel to drain the excess oil. Allow them to cool. 4) Stir yogurt and mix in cornstarch. Blend the caramelized onions and yogurt in a blender until smooth. Set aside. 5) In the same pan, heat the remaining 2 tbsp oil. Add the black cumin, cumin, cardamom, cloves, cinnamon and chili. Sauté for a few seconds. 6) Add the ginger and garlic pastes and sauté briefly. Add chicken, salt and red chili powder. Cook the chicken on medium-high heat for about 8 to 10 minutes until chicken is slightly brown and all the water dries up. 7) Add yogurt and onion mixture. Cover and bring to a boil. Reduce heat to low and simmer until chicken is half cooked, about 20-25 minutes. Add half cup of fresh cilantro and continue to simmer the chicken until it is fully cooked, about 45 minutes to an hour. 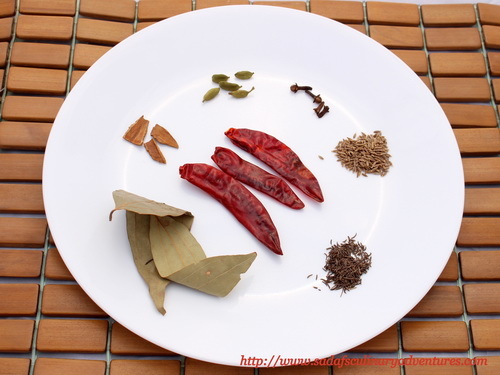 8) Discard bay leaves, cardamom, cloves, cinnamon and chili before serving, if desired. Garnish with the remaining cilantro and serve hot with rice or an Indian bread (naan or roti).